Indian Astrology/भारतीय ज्योतिष: Indian Astrology are the oldest literature and compendium of multitude of Knowledge. The history of Indian Astrology traces back to Vedic times, lakh of years ago from now. Indian Astrology can be divided broadly as Siddhanta Bhaga (Calculation part) and Phalita Bhaga (Predictive part). In Rig-Veda, the year is divided into 12 months, the special 13th month called extra month correlates the Solar and Lunar months. In Taittireeya Brahman, the 6 seasons are described in Indian Astrology. The details of planets as gods, solar and lunar eclipses are available in Rig-Veda. The oldest available book on Indian Astrology is ‘Rigjyothisha’, written by Lagadha. In this book, there are 5 types of years described, along with the ruling deities. The 2 ayanas (parts) of the year are also mentioned, along with their starting stars. Precision of equinoxes are explained. And the 27 stars are also given in this book. They are: 1. Surya, 2. Pitamaha, 3. Vyasa, 4. Vasistha, 5. Atri, 6. Parashara, 7. Kashyapa, 8. Narada, 9. Garga, 10. Mareechi, 11. Manu, 12. Angeerasa, 13. Lomasa, 1 4. Poulisa, 15. Chyavana, 16. Yavana, 17. Bhrigu and 18. Saunaka. All these five elements are taken into consideration while studying a horoscope, along with Constellations and Rashi or Moon sign. The fifth element, sky, or ether, is given utmost importance. Ascendant is the most effective point in anyone’s chart because it signifies ‘self’ and this point (ascendant) is ruled by the sky element. Indian Astrology or Moon astrology system follows a calendar based on constellations. It has the Moon in the centre. The Moon governs the mind and emotions. Moon is the fastest moving planet in the Zodiac and ‘no event is possible without Moon’s support’. 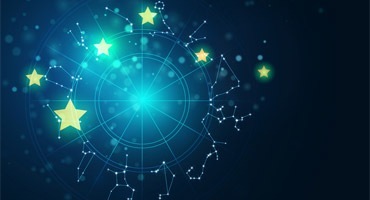 Those who know a bit of western astrology would know that there is a ‘void of course’ principle in western astrology which means that if there are no aspects to Moon, no event will take place. As such, both the luminaries are given equal importance but Moon because it governs the mind has been given prime importance in Indian Astrology or Moon astrology. Varahamihira (123 AD) wrote ‘Brihat Samhita’, a great work on Astronomy and Astrology/Indian Astrology. There are 105 chapters and 4000 verses in this book. He has shown how Indian Astrology can be applied for the welfare of public. Aryabhatta-I (476 AD) wrote ‘Aryabhateeya’, which comprise a great deal of Astronomy, Mathematics and Astrology. Even Astronomy of this book is spread to Arab countries. Aryabhatta-II (950 AD) wrote ‘Mahasiddhanta’, where he explained more clearly about calculation part of Indian Astrology. Bhaskara-I (629 AD) wrote ‘Mahabhaskareeya’, a book on Astro-mathematics. Bhaskara-II (1114 AD) gave ‘Siddhanta Siromani’ where a lot of Mathematics can be found. Details of square, square root, cube, cube root, factorial values, and factors of a number are explained. Details of planets, calculation of radius of earth, eclipses, and atmospheric layers (7 zones) above earth are discussed clearly. A lot of other authors like Kalyana Varma, Kalidasa, Venkatesa, Neelakantha, Mantreswara, etc. have published books on Indian Astrology. As per Vedas and Shastra there are five elements in total, which are: Fire, Water, Earth, Air, Sky. Zodiac is the outer wheel from where the radiation from different celestial bodies is received, filtered and sent to earth. Indian Astrology links the planets and stars with gods. Gods are representatives of certain types of energies. The entire Indian Astrology Zodiac chart is divided into 12 signs, starting from Aries, Taurus, Gemini, Cancer, Leo, Virgo, Libra, Scorpio, Sagittarius, Capricorn, Aquarius, and Pisces. There are 4 things to be done in a human life: Dharma (righteous path), Artha (wealth), Kama (Desire), Moksha (Unification of soul with God). These are one by one represented by the 12 houses of the zodiac. The hidden meaning is: A man should follow righteous path to achieve wealth and fulfil his desires. At the same time he must be desirous to reach God, and find ways to finally unify himself with the super soul. The potentiality to achieve this is represented step wise by the zodiac. Indian Astrology: Theory says that Indian Astrology Zodiac wheel starts with Aries 0 degrees, and is constant. When a top is rotating, it bends slightly and rotates. If a point is imagined on the top, it make circles. These circles will not coincide each other. There will be some deviation between each circle. Similarly, the Indian Astrology Zodiac sign is also deviating slowly from its constant position. It is calculated to be around 51 seconds per year. This deviation is called Precession of equinoxes, or Ayanamsa. Indian Astrologers are not taking this Ayanamsa into account when they calculate Planet positions. So their system is called ‘Narayana’. But westerners apply this correction in their calculations. There are 27 stars and each star has 4 Padas (quarters). Thus a total of 27 x 4 = 108 star Padas will will arise, which have been distributed in the zodiac. Since 12 signs are there in the Zodiac, every sign gets 9 Padas. Each Pada is of 3 degrees 20 minutes duration and 9 x 3deg 20min = 30 degrees. So each sign takes 30 degrees duration. There are planets whose role is to bestow the results of past deeds, done either in this birth or carried from previous births. Planets merely transmit the results which we earlier stored in the form of radiation. There are 9 planets identified: Sun, Moon, Mars, Jupiter, Saturn, Mercury, Venus , Rahu (Ascending Node) and Kethu (Descending Node). All the planets are not comfortable in all the signs. A planet is comfortable in its exaltation, or friendly or own house. Then it may give good results. A planet is not comfortable in enemy camp, and can give bad results. By observing the inter-relationships between the signs, planets, stars and their positions, we can understand the inherent capabilities of a human being, his thought process, and his weaknesses, and finally conclude what he has in store for his future. Various Dasa- systems are developed to know what planets are currently influencing a human being and promoting him to do what kind of things. In Indian Astrology Indians call planets ‘Grahas‘. Grah means that which catches. Grahas are those which catch the human beings and shed their influence on them. Grahas affect all inanimate and animate objects in this world. This is the reason Grahas are also personified as gods by Indians in Indian Astrology. Another greatness of Indian Astrology lies in providing remedial measures for various problems faced by human beings. The remedies of Indian Astrology are mentioned by sages in various works and also in Vedas. But the suitability of a remedy for a case is to be judged by a competent astrologer. Indians see Indian Astrology in everything. It became a part and parcel of their culture. For them Indian Astrology is ‘Veda Chakshu’, the guiding eye for moulding their future and attaining self- realization.